I love your recipes…I wish the site would load faster though. It’s a poor user experience. Since I work in digital advertising I strongly suspect it’s the number of ads (and images) per page. Sorry that an extra few seconds to load is “a poor user experience”. I am only able to share my recipes that you said you love because of advertisers. It’s how I support my family. I don’t notice my site taking any longer than others, to be honest. I run the stats on it and it always comes up similarly to friends’ sites. I must be missing something here. My page has minimal advertising at the top and the rest that takes a few seconds to load are pictures of more goodies that I would have otherwise missed. 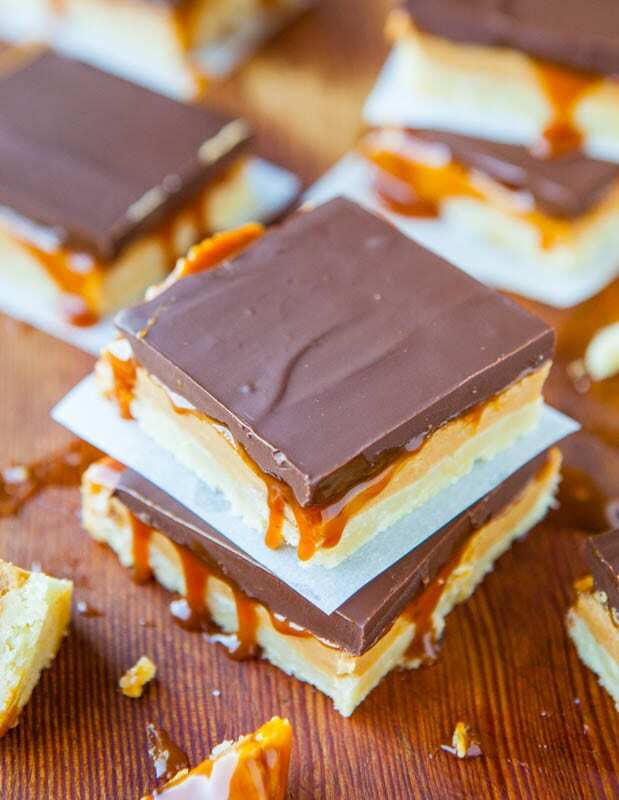 I LOVE seeing additional photos for new ideas, and having the recipe link above each one makes it so easy. The longest I ever had to wait for the entire page to load was MAYBE 25 seconds. 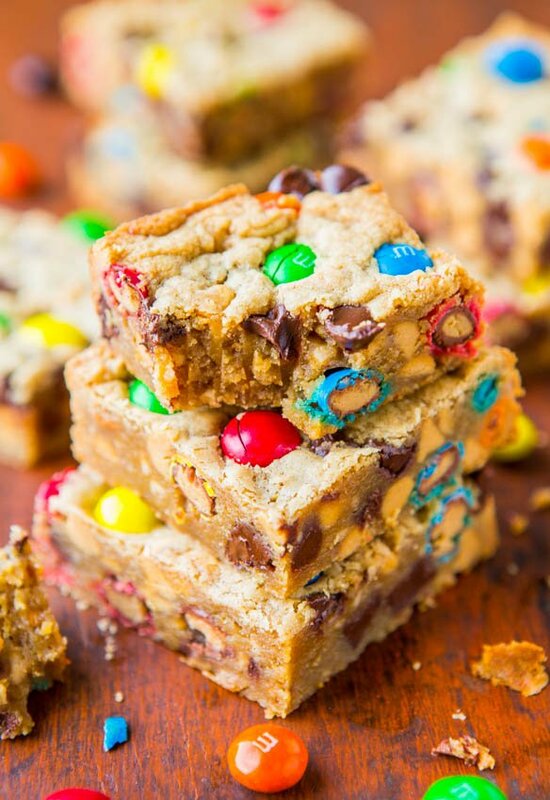 If that is too much time out of the day, then how will you ever find time to actually bake these delicious treats? 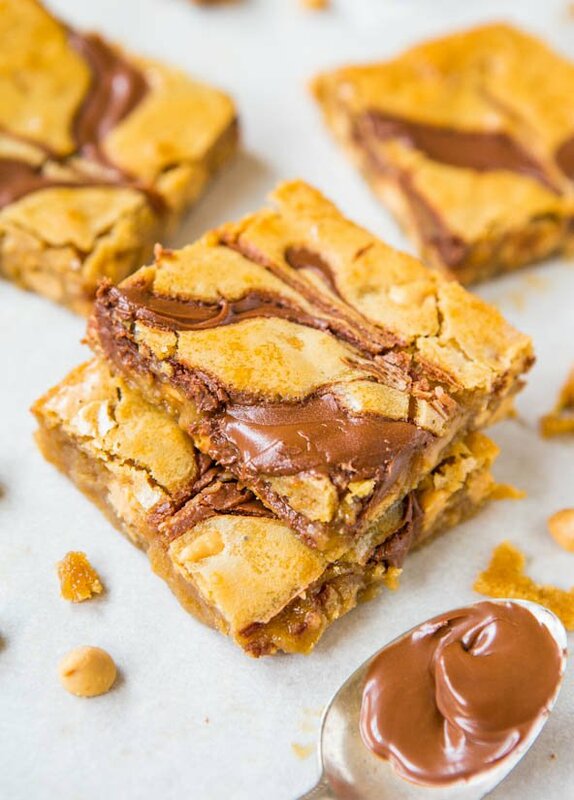 The Nutella bars were a hit at a picnic last weekend. Thank you Averie!!! 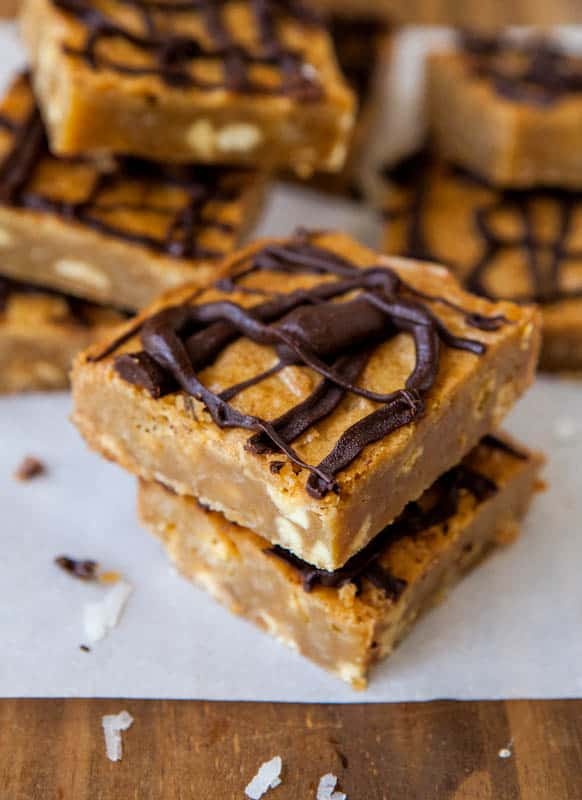 My family and friends and many people who’ve made these love the recipe as written but everyone’s tastes are different and reduce the sugar if that’s what you think will taste better. I don’t know if the recipe will work or not since I’ve never tried it that way. Tried the recipe again with 2/3 cup of sugar and 3/4 stick of butter. Also covered the pan with foil after 20 minutes of baking, as in my first batch the nutella sort of burnt. Perfect results with these little changes! 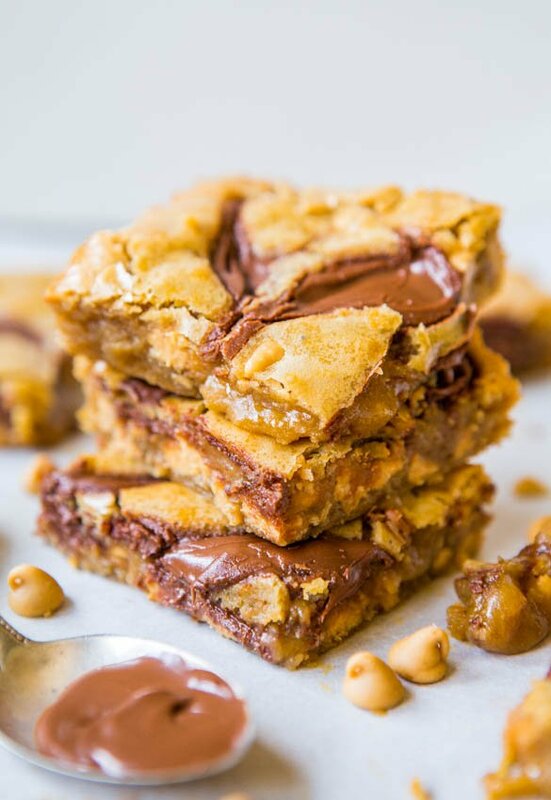 The combination of peanut butter, nutella and all the goeyness is great! Glad to hear the small changes worked well for you – wonderful! 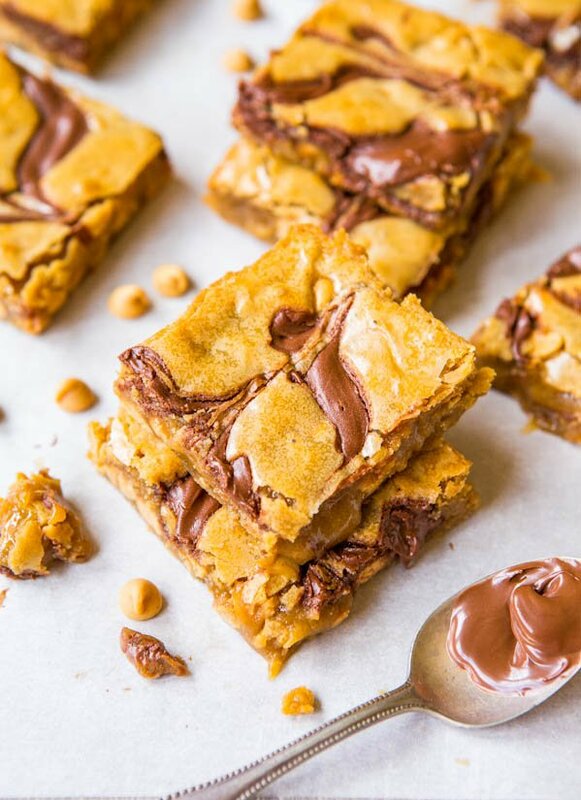 I just tried the nutella Blondie they r oh so soft chocolaty and crumbly… like totally first love for me in the kitchen… I don’t bake but today when I made these it was superb! Two thumbs upzzz!! I’m glad to hear you give them two thumbs up and even though you’re not usually a baker, you had great luck with these! Made these on Friday for my Christian small group meeting and everyone LOVED them! And they weren’t hard to make at all but turned out looking fabulous, which is awesome for a horrible baker like me. 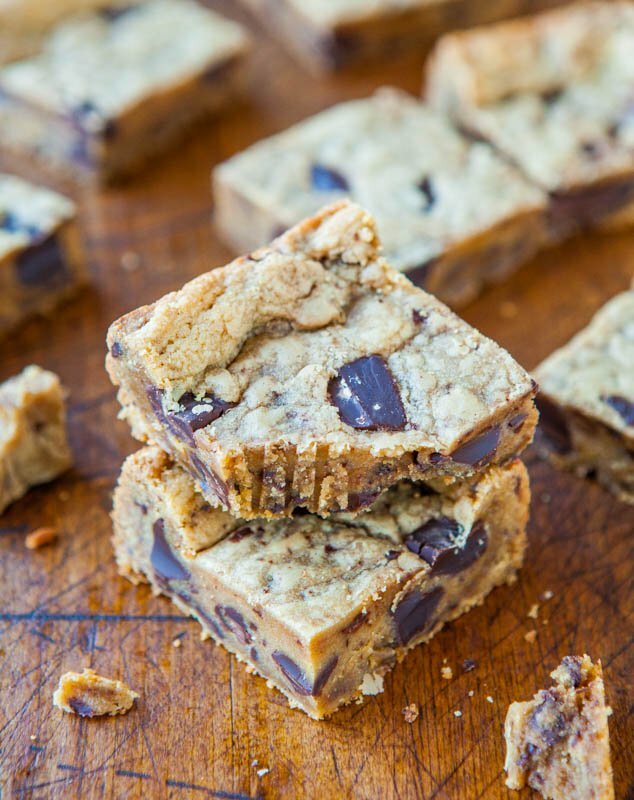 Thanks for sharing :) Can’t wait to try some of your other bar recipes. That’s awesome to hear you loved them and they turned out looking fab! And that you were able to share them with your group with rave reviews. Wonderful! If you make anything else, LMK! 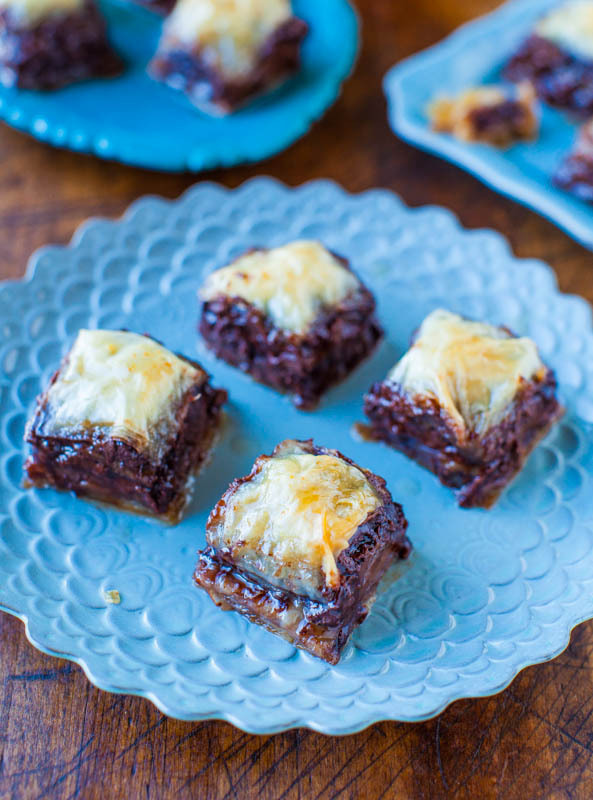 I have made these twice now – they are delicious! however, I cannot get the Nutella to swirl…and i end up just having a layer of Nutella on top of the entire brownie pan. so, they taste amazing and are a huge hit, but they just don’t LOOK amazing. the first time I made them, the Nutella was too thick to drizzle. the second time I made them, I decided to heat the Nutella to try to get it to drizzle, but this did not work either. what am I doing wrong??? Some jars of Nutella are really thick and almost ‘dried out’ even when you open them…ugh. For those jars, I heat the jar in the micro for 10 secs and stir really well. That should be enough. But heat in 10 sec bursts til it’s softer. Then, sort of drizzle it on or add it. If it’s still thick, almost like toothpaste, you can still work with that by using a toothpick to ‘cut’ into the thicker blobs and smooth them/swirl them. 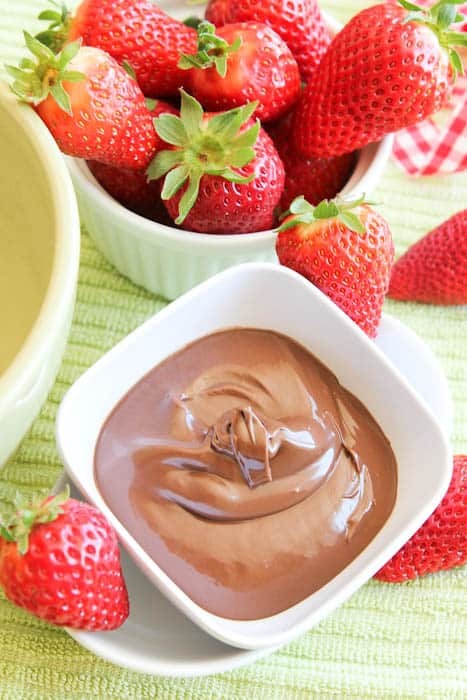 It can be a very delicate balancing act b/c Nutella (sadly) is NOT a uniform product. At least when I open a jar of Jif PB, it will always be the same; Nutella, meh not so much. Lmk how the next attempt goes! 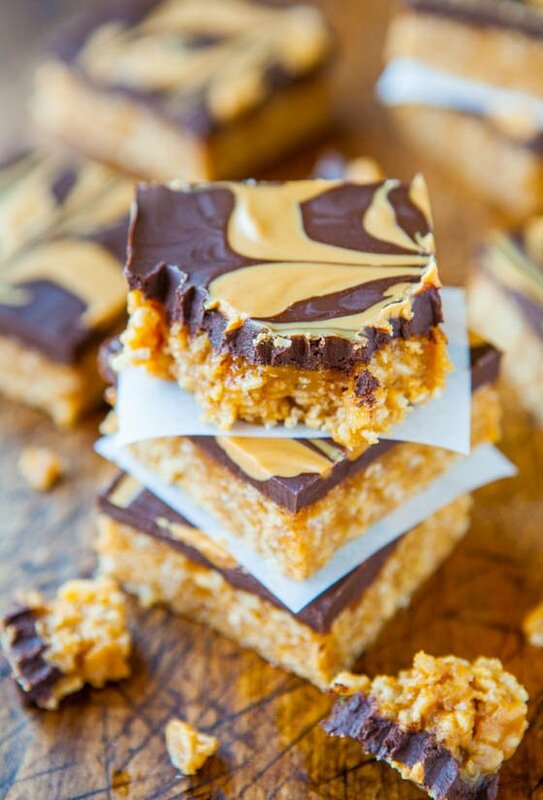 I have a batch of these in the oven right now! Have to say, that batter was SOOOO delicious!! Glad you love your pb as much as I do! I have them in the oven right now. I can’t wait. My only issue is that they are not cooking in the middle. I am not sure what I am doing wrong. I have had them in 35 minutes. I used a fresh jar of Nutella, so it swirled beautifully. Thanks for the recipe. I can’t wait to try some other things on your site. Do you see how gooey, soft, moist, and drippy mine are! Yes, that’s normal. I would say just bake until they seem to set up in the middle slightly without the edges getting too browned; however 35 mins does sound a bit long. I’d also buy a 5 dollar oven thermometer and double check your oven is running totally up to par. Enjoy the bars! 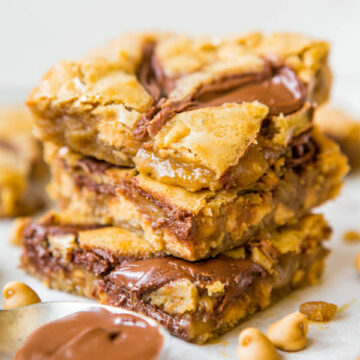 I baked these today but I could not find peanut butter chips anywhere so I used crunchy peanut butter instead and they turned out really lovely. I also heated them up and had one with ice cream which made for a great dessert! thank you very much for the recipe, I’m so taking some to my friend tomorrow! Sounds like the crunchy PB worked and I bet they’d be great with ice cream. Hope your friend enjoys them as well! Thanks for trying the recipe! 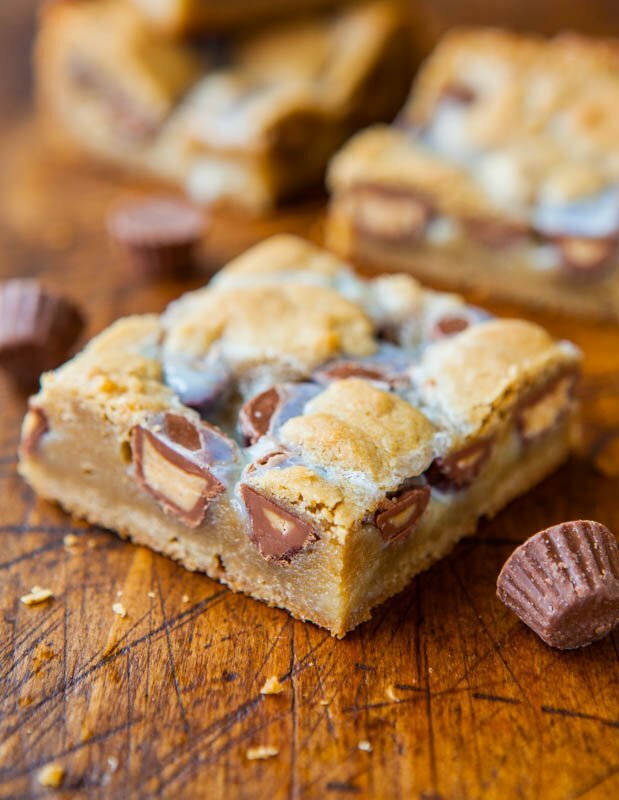 Peanut Butter Swirled Chocolate Chip Blondies are the ones or there’s PB & J Blondies – either are similar to these, with of course choc chips/jelly. You can’t go wrong with any of this stuff. Make what sounds good to you! Thanks for buying my book and for your support, Erica! :) LMK what you try and how it goes! I’ll definitely let you know which I go with, but either way I’m quite sure they’ll be delicious. 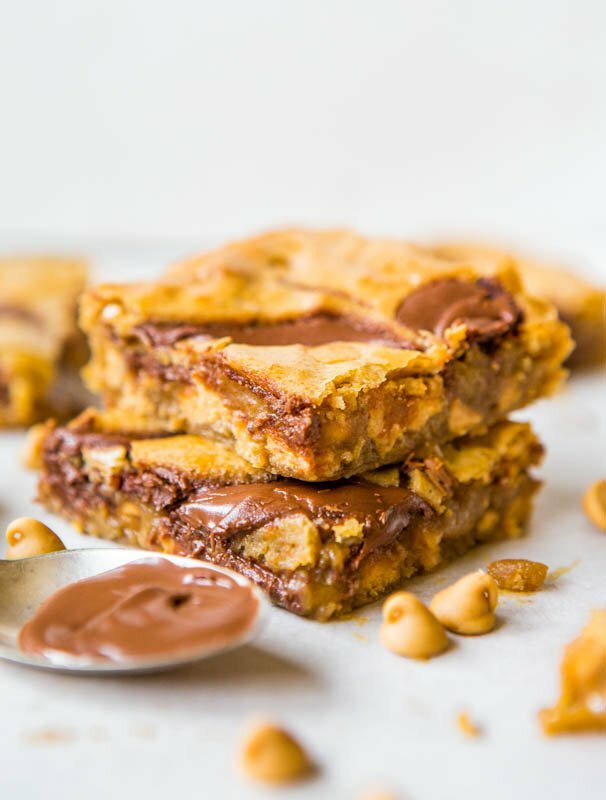 After I made your triple peanut butter monster bars, I knew I needed your cookbook! This recipe is amazing! So delicious and easy to prepare. I didn’t had the peanut butter chips, so I add some cashew instead. My family loved it. And I love your pics! Greetings from Brazil! So glad you like them and thanks for saying hi all the way from Brazil! SO DELICIOUS! 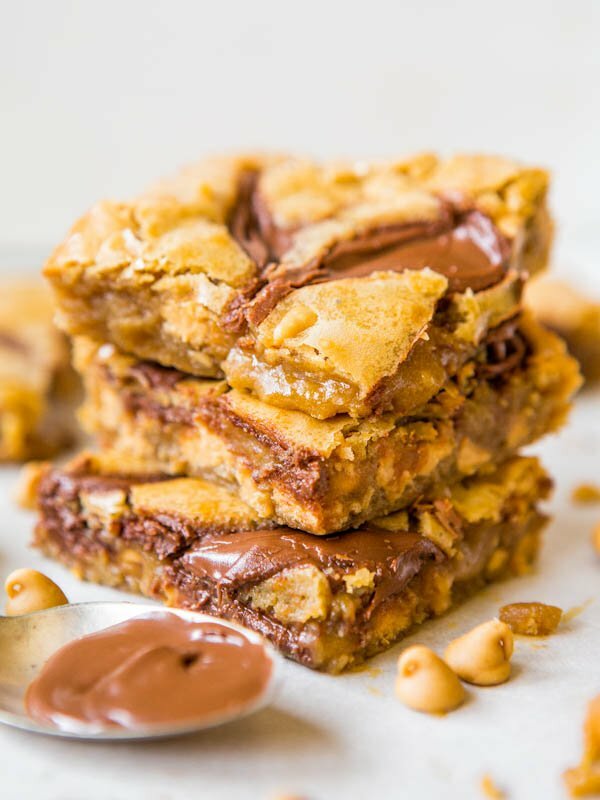 I used your peanut butter base from the Triple Peanut Butter Monster Bars and swirled in the Nutella, and they were to die for. As always, so easy, so yummy, and I already had everything on hand. Perfection! You can but just don’t over do it too much or you’ll have a gooey mess with BOTH the PB and the Nutella. Just use common sense and keep it on the lighter side so it’s not totally gooey or they won’t set up. LMK how it goes! Absolutely amazing!!!! This will be my go to recipe from now on. Thanks so much for something so easy and delicious! Hi, I am a fellow with Teach for China,and I am placed in a rural middle school. 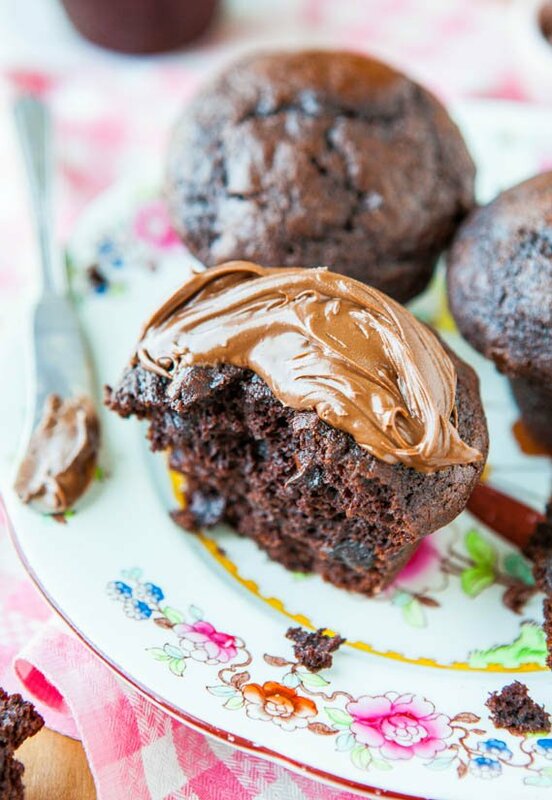 I have been experimenting with baking out of a rice cooker, and plan to try this recipe next! Made these bars and everyone loved them so much that they were requested again for a party tonight! These are the best. Thanks for the recipe! chocolate chips & choco peanut butter instead of peanut butter spread and nutella = THAT’S why you were having issues. 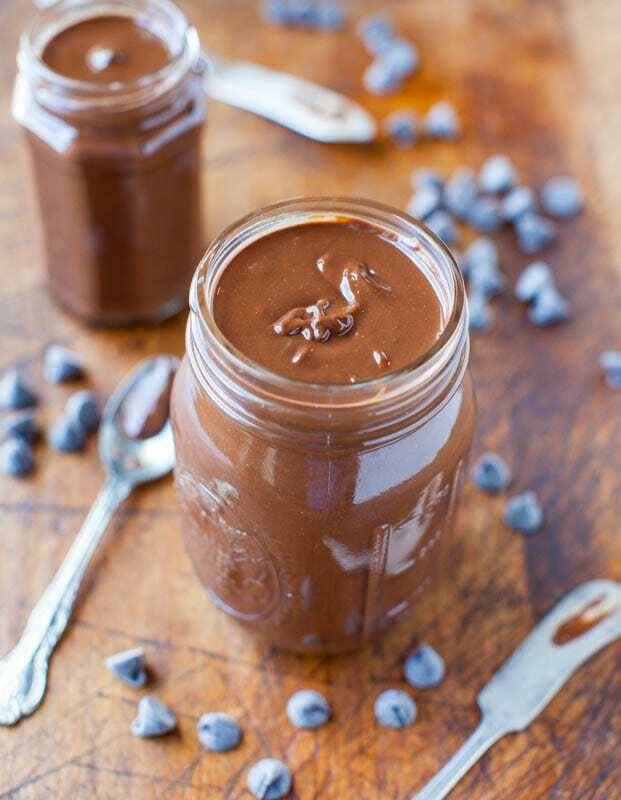 First, chocolate chips and chocolate peanut butter will be much THICKER than just using peanut butter and Nutella as I did. Secondly, you’ll be lacking flavor because the chocolate peanut butter isn’t as peanut buttery tasting as regular peanut butter. If you follow the recipe using the ingredients I called for, I’m sure you’ll have results much more in line with mine. Enjoy! I might have missed a previous question to this effect, but, how did you make the Nutella pourable? Did you thin it out at all or just heat it? Also, I’m making it for a potentially large group, would a double recipie work in a 9×13? 15 seconds in the micro generally will soften Nutella if you have a ‘thick’ batch. Some batches are much thicker than others Ive found and some are quite pour-able/runny. And this recipe would be fine to double. I haven’t personally tried that but I’m fairly sure it will be okay. Cup means yes, 1 cup. Use an online calculators for converting cups into grams for sugar. It sounds like you perhaps over-measured the sugar, didn’t mix it well enough (hence it being granular and not smooth) and sounds like you underbaked it since it was on the softer, mushier side. Quite a few things you did wrong but all are easy fixes. 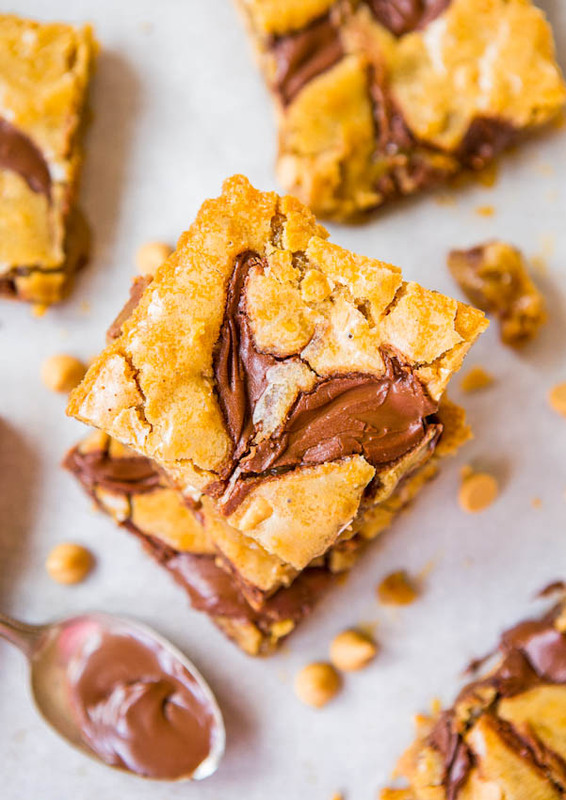 can peanut butter itself be used instead of the reeses chips or chocolate chips? 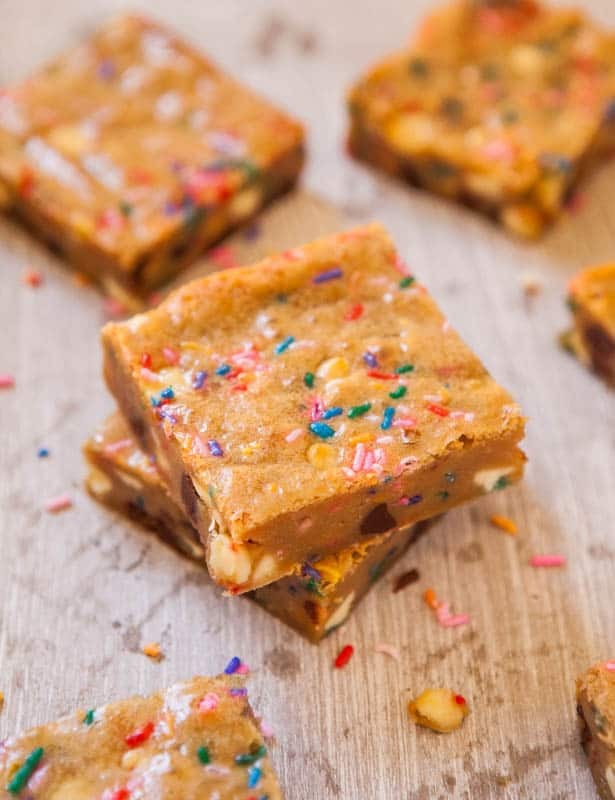 My husband picked out this recipe for me to make for him today, to enjoy this weekend… Well, after having just made them this afternoon, I can attest that they are super easy and ridiculously delicious. 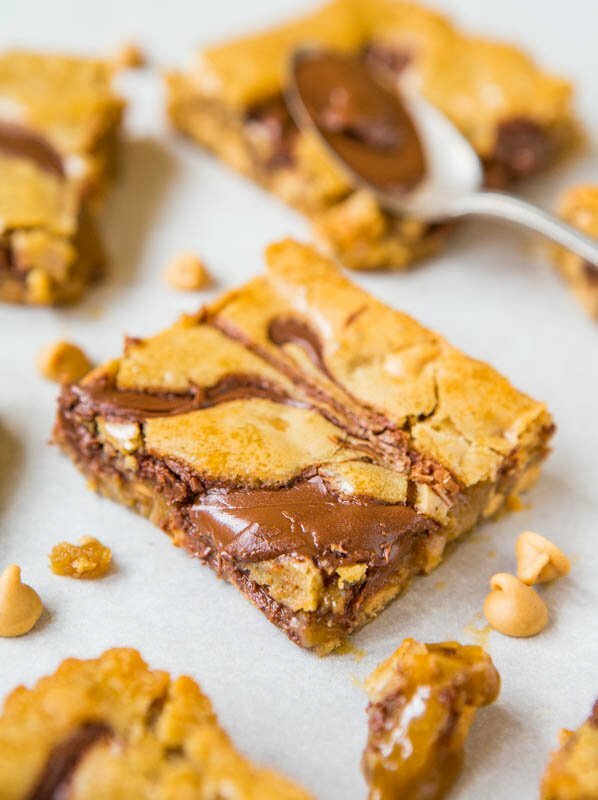 I’m really not much of a sweets person, and most of the time, I don’t bother to eat his cookies and brownies, but I had one bite and it lead to eating two whole brownies. Delicious with afternoon coffee. My only criticism – I would never just make one batch. This needs to be doubled in the future, they’ll be gone too soon. Oh – I read another comment regarding the nutella spreading. I wasn’t sure if heating it would be ok, so I spooned some in a good quality ziplock back, cut off the corner tip, and piped it through. Perfect.